The idea of strawberry maple jam has been on my mind for months. I wanted something that would be flavorful without being overly sweet. 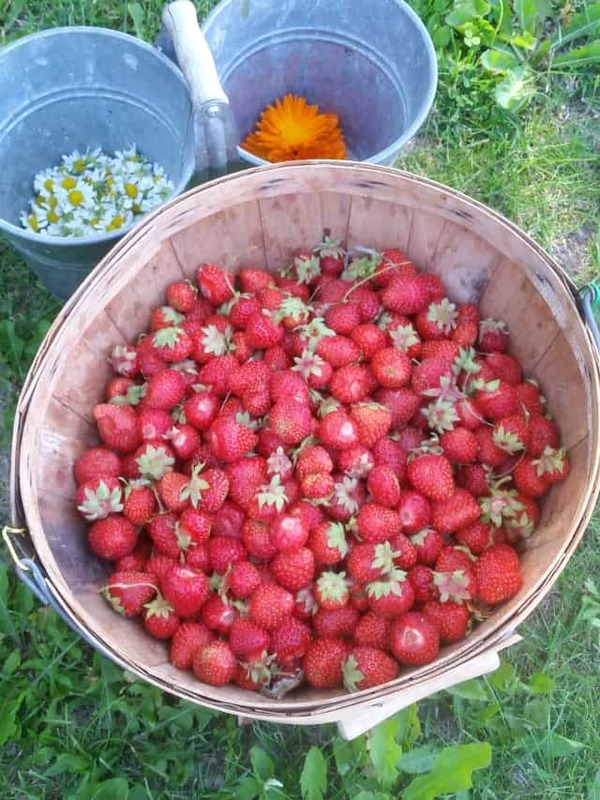 An something easy during the busy strawberry harvest and gardening months. This recipe turned out perfectly and is one that will be great in the pantry and as gifts later. 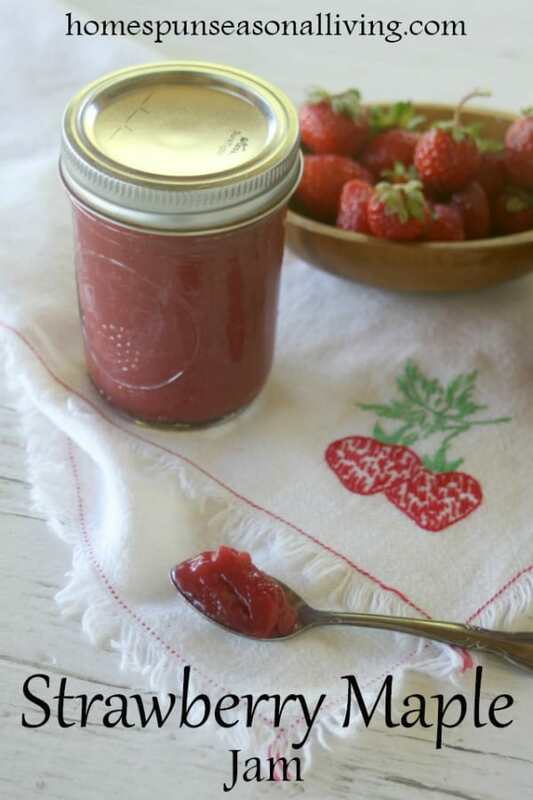 Most strawberry jam recipes start with crushing the berries. I do this myself in my favorite honey vanilla strawberry jam recipe. 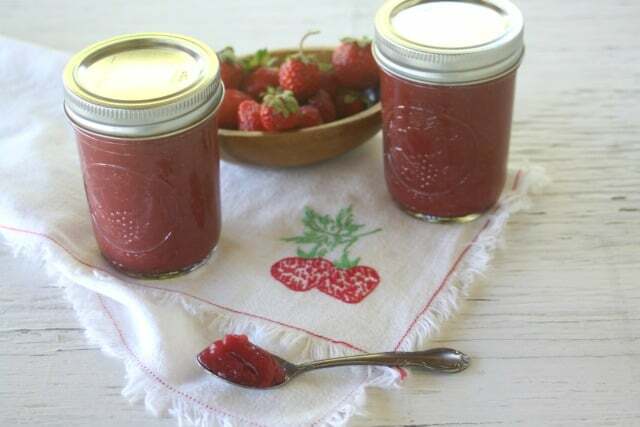 It's easy enough but that jam can often separate leaving more whole berries at the top and a strawberry jelly at the bottom of each jar. Not the worst thing in the world but not necessarily ideal either. 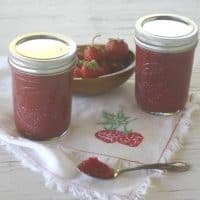 With this recipe, the berries are pureed first leaving a smooth consistency kind of like a jelly but without juicing and straining first. I don't make many jellies because I'm not a fan of the process much at all. Remember, we all need easy wins, myself included. This is the place for real maple syrup. Honestly, skip the maple-flavored stuff and go for the real deal. I know it can be expensive but it's worth it here. I happen to be blessed with maple trees that we tap but there are amazing small producers that will give you something wonderful to use here. I used pectin here because I wanted the jam to set while also keeping a vibrant flavor. Cooking it until gel-point felt wrong for the bright strawberry flavor I envisioned. I used the Real Fruit Low Sugar Pectin from Ball. Did you know you can buy it buy the jar now, not just the single boxes? Apparently I was a little behind the times but this stuff is pretty great and provided a wonderful set and texture for this strawberry maple jam. Want more jam & jelly recipes and canning advice? Check out my Fiercely DIY Guide! I did not test this recipe with anything but strawberries, yet. However, I believe it could be a success with most any berry you available or even a mix. Use what you have. This is an ideal for gift giving. Absolutely save some for your own pantry but make a couple of batches to tuck into care packages and gift baskets later too. A jar of this jam with a loaf of homemade peanut butter bread might just be the ideal gift for many. 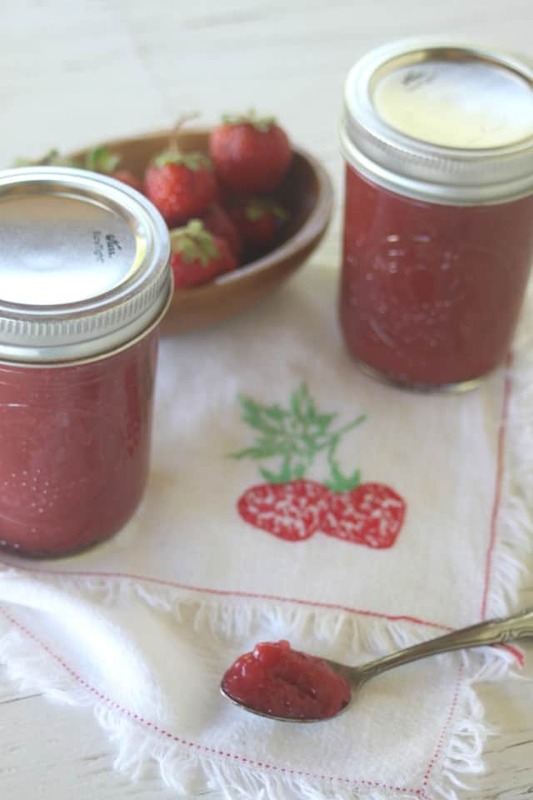 Make a quick and delicious preserve with this easy strawberry maple jam recipe. Lightly sweetened and full of flavor, it's sure to be a pantry favorite. Get canner ready (start the water boiling). Prepare jars, lids, rings. In a heavy saucepan, combine the pureed strawberries and lemon juice. Whisk in the pectin, making sure to get rid of any lumps. Set the mixture over high heat and bring to a boil. Stirring constantly. Cook until the boil cannot be stirred down. Add the maple syrup and bring back to a full rolling boil. Boil for 1 minute and then remove from heat. Pour the jam mixture into prepared jars, leaving 1/4 inch headspace. Wipe down rims, place lids, and tighten rings. Process in boiling water canner for 10 minutes (adjusting for elevation).